Bride and groom sit on elephants' back to the marquee. Wedding with elephants rituals are starting to perform by bride and groom are in front of the witnesses and elephants. Bride and groom stand in front of the elephants and all witnesses stand both sides of the elephants. Master of ceremony makes his greeting to every honorable witnesses with a beautiful and good meaning poetry (rhyme, or lyric) and get through the following rituals. Bride and groom together pour sand into a glass that means they have decided to use their life together. 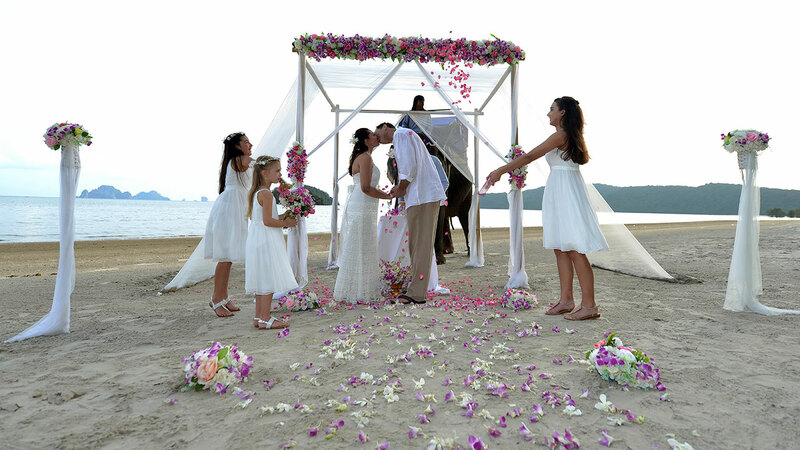 Bride and groom declared their love and promise to spend their life with love, honest and merge together forever. *** Optional for the couple want to do candle lighting ceremony - Bride and groom sit on the carpets in front of their seat and together make a heap of sand, lit candle(s) and put at the top and shower some flowers on. These show that two people have decided to be together and make their lives grow brightly and beautiful success. After completed this step, they come back to their seats. Groom and bride exchange their wedding rings as the sign that they are already married. M.C. or a representative gives blessing for wedding couple. As the just wedding couple are kissing the followers shower them with flowers. New wedding couple, witnesses and M.C. sign their names on the certificates. After that the wedding couple ride on the elephants' back to the next step, popped out marriage celebration champagne, plant a memorized tree and wave wedding flags. Wedding couple and their followers soar sky lantern and take photographs. End of the ceremony, everybody go back to the hotel happily and safely.